As a general rule, I do not review books here that I would not happily add to a school library. This blog started with my students asking, "but if you leave who will tell us about the GOOD books?" when I went on hiatus a year ago. It is the perennial question. Kids will look around a library, query the catalog and then with all sincerity ask, "where are the good books?" as if the thousands of volumes lining the walls are the "bad" ones. In fun I would think, "oh yes, the good ones. I keep THOSE hidden back in the office." What the kids are saying is, "this is too much, too overwhelming, just show me, tell me, talk to me about some books I would like." Reading is personal. Some kids are independent explorers, some want a guide. This seemed like a fun way for my students and teachers to continue our book moots. Overall, BookMoot tries to celebrate the good books, the diverse, the serious, the hilarious, the newsworthy, the sad, the controversial (No-Nothings beware, I love those) the mysterious, the just-for-fun, the factual and the fantastic books. Library books are expensive and budgets are tight. That being said, I offer the following as a caution. We stopped by our bookstore today as kind of a school-starts-tomorrow-last-fling-of-summer deal. As the entlings tore off to the manga section I pulled some books from the "back to school" display. This title was being offered as a "great read for the start of the school year." I must protest. I am trying to remember why Couric went into the kids' book business. Wasn't the day job working out Katie? As I picked up the book from the display it was not displeasing to look at. Although the illustrations are working hard, they cannot rescue this book. The storyline was predictable, heavy handed and pedantic. The new kid in school looks and sounds different and he is treated badly. The rhyming verse just saws away. It lumbers along in a forced and sing-song fashion. "His name is a different one, Lazlo S. Gasky. He's new to our school and the town of Delasky." Wow, how about that. The kid's last name happens to rhyme with the name of the town. Golly. To go on any further would be cruel. Couric and other lesser lights are under the impression that a tale must be moralistic in order to appeal or impress children. I suppose it does impress unsuspecting parents and grandparents who will misguidedly but with the best of intentions, purchase this book. 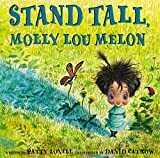 If you are looking for a REALLY good book with this theme, go get Stand Tall, Molly Lou Melon by Patty Lovell with divine illustrations by David Catrow.